For several years now, gluten has been the subject of much debate, discussion, and disagreement. Grocery stores and restaurants now offer a plethora of gluten-free products and meals. You might have friends or family members who avoid gluten. Perhaps you follow a gluten-free diet, or have been paying closer attention to food labels and avoid it most of the time. Maybe you aren’t even exactly sure what the heck gluten IS and are wondering why so many people avoid it like the plague. Gluten is a complex two-part protein found in grains such as wheat, rye, barley, and spelt. The two different proteins that comprise gluten are called glutelin and gliadin. Breads, cereals, and baked goods are obvious sources of gluten (unless they are labeled gluten-free), but they aren’t the only foods that contain the protein – it can be found in many items, even those you wouldn’t expect. There ARE people who absolutely should avoid gluten entirely. Let’s discuss the health conditions that make the consumption of gluten dangerous. People who have celiac disease, a chronic autoimmune/inflammatory disorder, must avoid the consumption of gluten. Celiac disease originates in the gut, but affects the entire body when untreated. In people with celiac disease, the villi of the small intestine are damaged when gluten is consumed. When a person with celiac disease continues to eat gluten, serious health problems can develop. Symptoms of celiac disease include (but are not limited to) abdominal pain, diarrhea, constipation, bloating, weight loss, fatigue, anemia, arthritis, and headaches. There are over 300 symptoms that are known to be caused by celiac disease…but some people with the condition have no symptoms at all. But discomfort and pain aren’t the only problems celiac disease causes: the immune response that attacks the small intestine leads to damage to the villi, which are small finger-like projections that line the small intestine. The villi promote nutrient absorption, and when they become damaged, nutrients cannot be absorbed properly into the body. Undiagnosed or neglected celiac disease can lead to serious health problems, including osteoporosis, anemia, vitamin and mineral deficiencies, nervous system disorders, depression, dermatitis herpetiformis (blistering, intensely itchy skin), pancreatic insufficiency, intestinal lymphomas, GI cancers, and other autoimmune disorders. There are several serologic (blood) tests available that screen for celiac disease antibodies, but the most commonly used is called a tTG-IgA (Immunoglobulin A) test. If test results suggest celiac disease, the next step is usually a biopsy of the small intestine to confirm the diagnosis. Currently, the only way to treat celiac disease is by strict adherence to a gluten-free diet. Many people believe that gluten consumption is harmless in those who do not have celiac disease or an “allergy”, but studies suggest the issue is far more complicated than that. Many people who lack the characteristic blood, tissue, or genetic markers of celiac disease experience celiac-like GI symptoms (as well as non-GI symptoms including fatigue, cognitive difficulties, and mood disturbances) after consuming foods that contain gluten. Researchers call this condition non-celiac gluten sensitivity (NCGS) or non-celiac gluten or wheat sensitivity (NCWS). There is no clear definition for non-celiac gluten sensitivity. The diagnosis is made when a patient reacts negatively to gluten, but celiac disease and allergies have been ruled out. One explanation for NCWS is that exposure to the offending grains somehow triggers acute systemic immune activation, rather than a strictly localized intestinal immune response. Because there are no biomarkers for NCWS, accurate figures for its prevalence are not available, but it is estimated to affect about 1 percent of the population, or 3 million Americans, roughly the same prevalence as celiac disease. While the NCWS group did not have the cytotoxic T cells found in those with celiac disease, they DID have markers of intestinal cellular damage related to a severe systemic immune activation. The study found that NCWS is linked to a weakened intestinal barrier that allows the movement of microbial and dietary molecules from the intestines into the rest of the body. This, researchers suggest, ultimately results in the body-wide immune response that patients saw in response to gluten. Study participants with NCWS who excluded wheat and related products from their diets for six months saw improvement in their symptoms and effects. Wheat allergyis an immune reaction to any of the hundreds of proteins in wheat. When a person has a wheat allergy, one type of white blood cells, called B-cells, send out immunoglobulin E (IgE) antibodies to “attack” the wheat. At the same time, local tissues in the body send out natural chemical messengers to alert the rest of the body that there is a problem. This reaction happens very fast (within minutes to a few hours) and can involve a range of symptoms from nausea, abdominal pain, itching, swelling of the lips and tongue, to trouble breathing, or anaphylaxis (a life-threatening reaction). A person with a wheat allergy must avoid eating any form of wheat, but does not have trouble tolerating gluten from non-wheat sources. (It is possible for a person to be both allergic to wheat and have CD or NCGS.) In the United States, wheat is one of the eight most common foods to which people are allergic. Children who are allergic to wheat may out-grow the allergy, but adults with an allergy to wheat usually have it for life. The only treatment is a wheat-free diet. It is important to understand that even if you are not allergic to wheat and don’t believe gluten causes problems for you, there are other components in wheat that can be very damaging to your health. For more on that, please check out this well-researched article from Paleo Leap: 11 Ways Gluten and Wheat Can Damage Your Health. It is. Thankfully, it is rare. This damage potentially can cause problems with your gait and with your gross motor skills, resulting in loss of coordination and possibly leading to significant, progressive disability in some cases. However, because gluten ataxia is so relatively new, and not all physicians agree that it exists, there’s as of yet no accepted way to test for it or to diagnose it. When a person has gluten ataxia, the antibodies the body produces in response to gluten ingestion mistakenly attack the cerebellum, the part of the brain responsible for balance, motor control, and muscle tone. This autoimmune attack usually progresses slowly, but the resulting problems in balance and motor control eventually are irreversible due to brain damage. Up to 60% of patients with gluten ataxia have evidence of cerebellar atrophy (shrinkage of that part of their brains) when examined with magnetic resonance imaging (MRI) technology. In some people, an MRI also will reveal bright white spots on the brain that indicate damage. Gluten ataxia symptoms are indistinguishable from symptoms of other forms of ataxia and can include progressive balance difficulties, unsteadiness, problems swallowing, slurred speech, double vision, bladder control problems, and trouble with fine motor skills. Gastrointestinal problems are not often present in gluten ataxia cases, which can lead to delayed diagnosis. Diagnosis is tricky, but if symptoms stabilize or improve after gluten is removed from the diet, it is likely that the ataxia was caused by gluten. 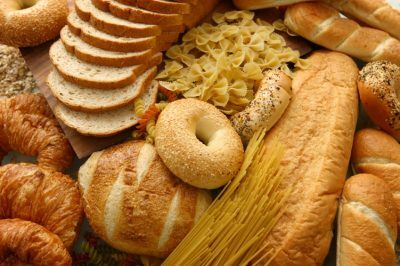 Celiac disease is not the only autoimmune disorder that has been associated with the consumption of gluten (and other grains). So have others, including thyroid disorders, type 1 diabetes, rheumatoid arthritis, psoriatic arthritis, and psoriasis. Gluten has been shown to trigger inflammation – and we know that inflammation is the likely cause of a multitude of health conditions, including arthritis, asthma, cancer, chronic pain, headaches, and heart disease. The Celiac Disease Foundation notes that there are many food items that may contain gluten, often in hidden or unexpected ways. Special note about oats: While oats are naturally gluten free, they may be contaminated. Therefore, it is safest to only consume oats with a gluten-free label. For a full list of foods and other products that contain gluten, please see Sources of Gluten. Could something other than gluten be causing the health problems often blamed on gluten? While it is important to remember that people who have been diagnosed with celiac disease absolutely need to avoid gluten entirely, the issue isn’t as clear for those with NCWS. Science has demonstrated that gluten is poorly digested in all populations, but there may be other culprits that cause the more severe and chronic symptoms many people who do not have celiac disease experience. It is possible that FODMAPs (Fermentable Oligo-, Di-, Mono-saccharides and Polyols), a group of poorly digested carbohydrates, are the actual cause of digestive troubles in some who believe gluten is the problem. FODMAPs are small, short-chain carbohydrates that are found in many foods – including those that contain wheat and other gluten-containing grains. Many people are unable to digest FODMAPs properly. Studies show strong links between FODMAPs and digestive problems including gas, bloating, stomach pain, diarrhea, constipation, and irritable bowel syndrome (IBS). An estimated 14% of people in the US have IBS (most of which are undiagnosed), so the implications of this are significant. One study of 37 people with self-reported gluten sensitivity placed participants on a low-FODMAP diet, which reduced symptoms. The participants were then given isolated gluten, which did not affect their digestive symptoms. This suggests that FODMAPs may be the true culprit for many people who think they react negatively to gluten. Because FODMAPs are found in so many foods, it is extremely difficult to entirely eliminate them from your diet. But, minimizing intake is often enough to help reduce symptoms of sensitivity. If you follow a gluten-free diet and still experience unpleasant gastrointestinal symptoms, it may be worth trying a low-FODMAP diet to see if your symptoms improve. The herbicide glyphosate has been surrounded by controversy for years due to health dangers associated with the product. Created by multinational agrochemical and agricultural biotechnology giant Monsanto and sold under the trade name Roundup, it is the mostly widely used weedkiller in the world. While an in-depth discussion about glyphosate is beyond the scope of this article, it is important to understand that the findings of some studies suggest that it may act as a selective antibiotic in the human gut, killing off beneficial bowel flora species, while encouraging the growth of pathogenic (disease-causing) species. There is growing suspicion that glyphosate can act as an antimicrobial or antibiotic. (Monsanto even has a patent for glyphosate as an antimicrobial.) Animal model data demonstrate that glyphosate selectively kills beneficial bacteria, such as Enterococcus faecalis, Enterococcus faecium, Bacillus badius, Bifidobacterium adolescentis and Lactobacillus species, while allowing the proliferation of undesirable, even disease-causing, species such as Salmonella enteritidis, Salmonella gallinarum, Salmonella typhimurium, Clostridium perfringens and Clostridium botulinum. Lactic acid producing bacteria that have beneficial effects, such as lactobacilli, lactococci, and enterococci, generate bacteriocins, or factors that suppress growth of undesirable bacterial species. Specifically, the bacteriocins produced by lactic acid producing bacteria help keep Clostridium species at bay, such as C. difficile that often emerges after antibiotics are prescribed. (Farmers in Europe are even seeing an increase in botulism in livestock due to emergence of Clostridium botulinum that is suspected to be due to glyphosate.) This selective effect of glyphosate, killing off lactic acid producing bacteria while leaving undesirable species untouched, may be one of the ways by which humans develop dysbiosis, or disordered growth of bowel flora, that can cause abdominal distress, irritable bowel syndrome, the intestinal “leakiness” that adds to risk for autuoimmune diseases, and other conditions. Some argue that gluten is not a problem at all as long as one consumes products that are organic and GMO-free (grown without exposure to glyphosate). However, if this were the case, all of the health problems associated with gluten (and wheat) would disappear in individuals who choose GMO-free options, and that isn’t always the case. If you believe you may have celiac disease, it is important to consult with your healthcare provider because of the seriousness of the disorder. If you don’t think you have celiac disease, but believe you might benefit from avoiding gluten, it couldn’t hurt to eliminate it from your diet for a few weeks to see how you feel. Going gluten-free does NOT guarantee weight loss – in fact, it wouldn’t be hard to GAIN weight while following a gluten-free diet if you consume gluten-free junk foods like cookies, cakes, crackers, and breads. No substitutions for gluten-containing products are necessary, as those foods are usually highly processed anyway. Beware of the “gluten-free” labels that are popping up on products all over stores – many of those products are junk foods, loaded with sugar and other things you don’t need in your diet. Despite what some would like you to believe, gluten-free diets are NOT inherently unhealthful. Building a diet based on meat, poultry, fish, eggs, beans, dairy products, fresh fruits and vegetables, nuts, seeds, and other healthful whole foods is the best way to go gluten-free. You might have heard that grain-free diets could cause a folic acid deficiency (which can be dangerous to a developing fetus). The truth is more complicated. Vitamin B9 is an essential nutrient that naturally occurs as folate. Folic acid refers to an oxidized synthetic compound used in dietary supplements and fortified foods. Folate aids the complete development of red blood cells, reduces levels of homocysteine in the blood, and supports nervous system function. People most at risk of a folate deficiency include pregnant women, breastfeeding mothers, people with liver disease, alcoholics, people on kidney dialysis, and people on certain medications for diabetes. The body does not convert folic acid into active vitamin B9 very well, so un-metabolized folic acid may build up in the bloodstream – which may increase cancer risk. Excellent sources of dietary folate include romaine lettuce, spinach, asparagus, turnip greens, mustard greens, parsley, collard greens, broccoli, cauliflower, beets, avocado, chickpeas, lentils, and liver – no grains needed! On a strict low-carb diet the brain can be primarily fueled by fat. The fat gets converted in the liver to ketones, that are used by the brain as fuel. This means that fat-burning goes up significantly – a big plus for people who want to lose excess weight. Furthermore, our body can produce the glucose it needs through a process called gluconeogenesis, converting other nutrients to glucose. There is no need for carbohydrates in the diet, and the brain functions fine without it. In fact, low-carb (25 to 150 grams of carbs per day) and ketogenic (50 grams or less per day) diets can actually be beneficial for certain brain disorders, including epilepsy and Alzheimer’s disease. In addition, a large recently published study revealed that low-fat, high carbohydrate diets increase the risk of death. You might be wondering about fiber – what about all those cereals and breads that boast of high fiber content? Companies that make those products want you to believe you need grains in your diet because they contain fiber…completely neglecting the fact that fruits, vegetables, nuts, and seeds are all excellent sources of fiber (and are all naturally gluten-free). In addition, they all naturally contain far more nutrients than cereal or other grain-based foods (especially the processed ones). In fact, the majority of the research supporting the benefits of dietary fiber come from epidemiological studies that link the consumption of fiber-rich fruits and vegetables with a lowered risk of certain diseases such as obesity, heart disease, and cancer (particularly colon cancer). And, when tested in the lab, controlled intervention trials that simply add fiber supplements to an otherwise consistent diet have not shown these protective effects. Ultimately, the choice is yours. If you want to continue eating foods that contain gluten, by all means – please do. I’m not here to tell you what to do with your body. But the main point I want to emphasize here is this – humans don’t NEED to consume gluten, and many people report feeling better after going gluten-free. If you are concerned about the possible health risks associated with gluten, there’s absolutely no harm in removing it from your diet to see how you feel. It could make a huge difference in your health – you won’t know until you try. Often, we get used feeling less-than-great – it becomes our “normal” – and don’t realize our health was suffering until we make changes to improve it. For those who are still skeptical (or want inspiration), please read my dear friend Melissa’s personal story about her battle with NCWS and the amazing health transformation she experienced when she removed gluten from her diet.